[show all]Christmas is coming and Charlie and Lola have received an advent calendar to help them keep track. The calendar has a flap to open for each day leading up until Christmas. At school, they find that many of their friends have received the same calendar, so they trade stories of what things they found underneath the flaps. 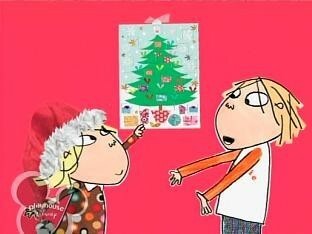 Charlie and Lola also get ready for Christmas, discussing wanted gifts, making cards, and writing letters.On Christmas Eve, Lola discovers something disturbing - the flap for Christmas has disappeared from the calendar. The two go inside the calendar to find out what happened with Christmas.